On ancient maps, unknown regions were tagged, “here be dragons”. Does it sometimes feel like there are fire-breathing monsters lurking around every corner? Life is unpredictable and finite. It may be hard to even pause and ponder what matters most. The information overload of modern times creates stresses. The path to making decision or taking action is unclear and the lack of clarity can lead to inertia–I don’t even know where to start. The Index card cure™ (ICC) life management system is an interactive platform for managing the overwhelming choices of modern life. 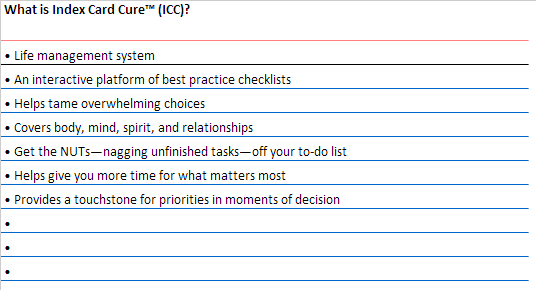 ICC may be a key that unlocks the door to getting things done. March 28, 2014 in Need-to-know.